I bought this Roamer on eBay to restore. I don’t do that as much as I used to but I still like to have a project watch to work on every now and then. Like most Roamer watches, it has an in-house movement. This particular watch is powered by the MST 414 which has a micro regulator so it can be regulated very accurately. The movement, the ‘R-logo’, and the fact that the case back has the Swiss cross and 4 patent numbers indicate that the watch is from 1966. If you look closely, you’ll also see “Pm” just right of the number 6 on the chapter ring. That stands for Promethium, a lume that they used in the 1960s after they stopped using Radium and before they started using Tritium. The winding of the crown was difficult and the crystal was damaged. The watch did run but it needed to be serviced and regulated. Make sure to remove all the power from the mainspring before you start working on a movement. This is to prevent damaging the escapement while working on the wheel train. Move the click away from the ratchet wheel while slowly letting the crown slip between your thumb and index finger. Don’t let it snap because that might damage the mainspring. Lift the balance and the pallets and store them somewhere safe. Turn the movement around and remove the cannon pinion. You can’t lift the center wheel later if you don’t remove the cannon pinion at this stage. Lift the wheel-train bridge and remove the escape wheel, the third wheel, the centre seconds wheel, and the mainspring barrel. As you can see, there’s a lot of old grease in the keyless works, especially on the set lever spring and the return bar. I cleaned as much as possible with a peg wood. Don’t forget the KIF Duofix of the escape wheel. It’s technically not a shock protection system, just a cap jewel with a spring to hold it in place. Gently hold down the spring with a peg wood when you remove it because it will fly across the room if you don’t. First of all, lubricate the cap jewel of the KIF Duofix and reinstall it with the spring. Place the third wheel, the center seconds wheel, and the escape wheel in position. Install the wheel train bridge. Flip the movement to the top plate and reinstall the pallets (give the watch a few winds so you can check the working of the pallets). When you place the balance, the movement should come alive. Now it’s time to remove the Incabloc chatons and capstones. Use a pegwood to clean the capstone before you clean it with One Dip or something similar. Lubricate the capstones and reassemble the shock protection system on both sides of the movement. 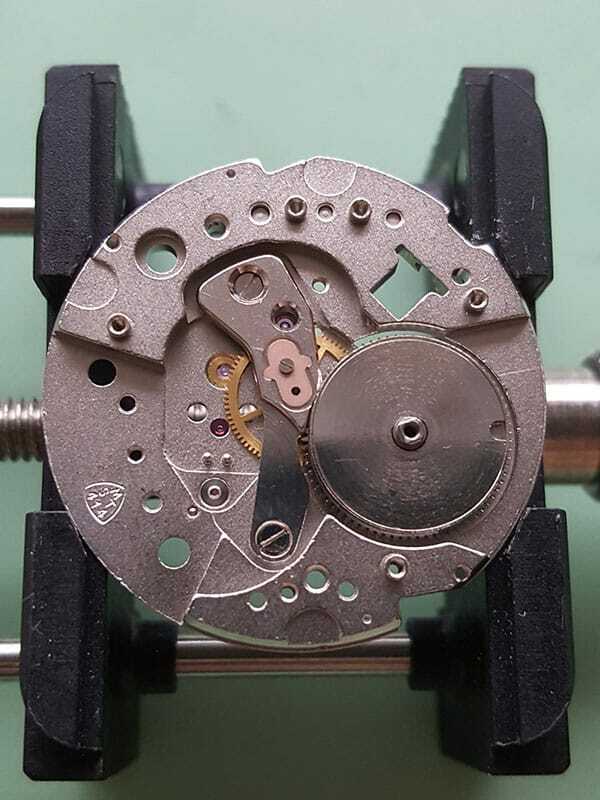 Place the hour wheel and washer in position, fit the dial and continue with casing the movement. I fitted a new top glass because the old crystal was too damaged. There was a lot of dirt and grease around the tube and inside the crown. I used a peg wood and an old toothbrush to remove most of it and then I cleaned them in the ultrasonic cleaner. I slightly lubricated the tube with KT-22 grease and the crown works very smoothly again. Interesting. i am going to look for a similat one here in Switzerland. What price range are these watches? Hi, I bought it for $35 but it needed some work. The case, dial, and hands are in excellent condition and the movement is running very well after the service. The plating on the side of the top left lug is a bit worn though. Thanks for the kind words, Bob. Though I’m not extraordinarily talented and I’m sure you could do it too. 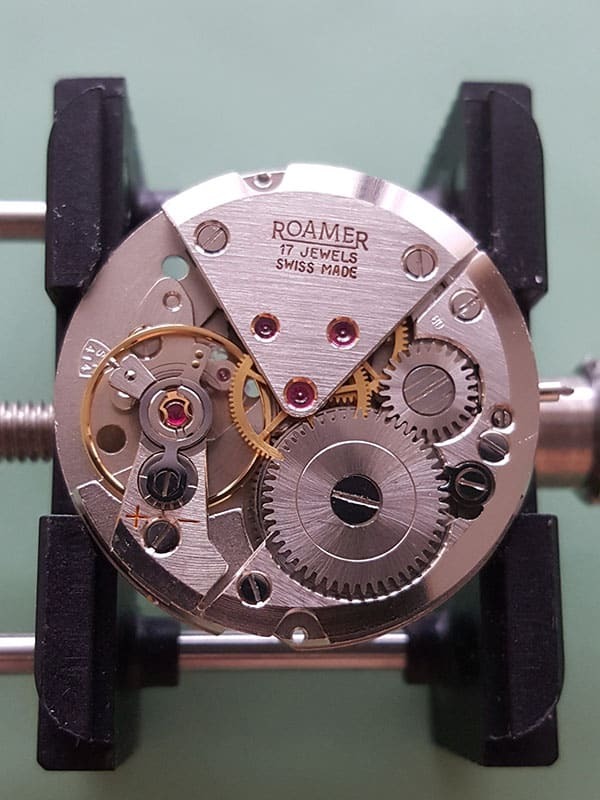 This Roamer is 33 mm without the crown. It’s fascinating to see this process of disassembly. Thanks a lot, Melvin. I have a 414 that’s quite similar to your example, except for the logo, which is a golden metal applied piece with RW printed above in black. I suspect the hours and seconds hands in my example are aftermarket. I’ll follow your site for more information. Love the attention to detail!